Daily Illuminator: Check Out The SJ Games Case At New York Toy Fair! February 16, 2018: Check Out The SJ Games Case At New York Toy Fair! The SJ Games case at New York Toy Fair is an annual tradition, featuring our hottest new and upcoming titles. This year's case celebrates the Munchkin Collectible Card Game in all its glory! If you are at New York Toy Fair, share pictures of the case with the hashtag #PlayMunchkinCCG and we'll share them! And remember to preorder with your local game store so you don't miss out. Simply print out our preorder form, fill it out, and give it to your store so they know you are interested! 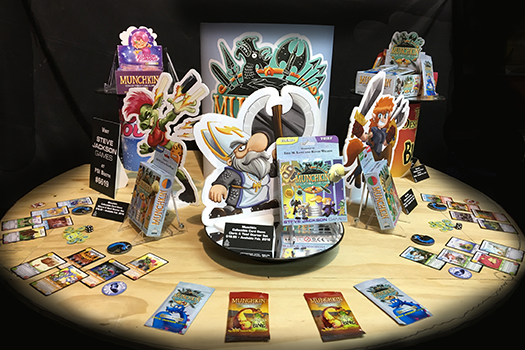 While you're in the area, check out our Munchkin Collectible Card Game prereleases happening around New York and New Jersey this weekend as well! Reserve your seat with the store; space is limited. See you in New York!